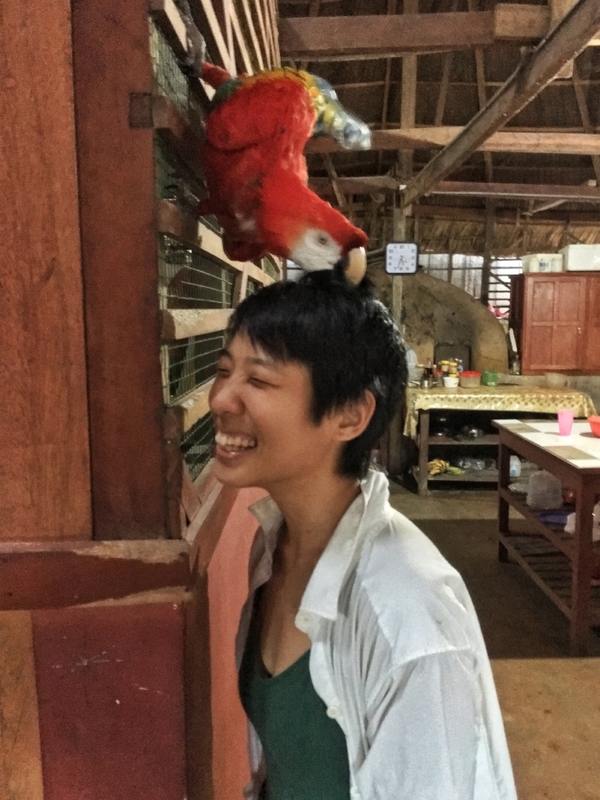 Over the past fall/winter, I spent five weeks as a resident artist at Sachaqa Art Center in the Peruvian Jungle. Sachaqa means 'Spirit of the Forest', and it is quite the fitting name. 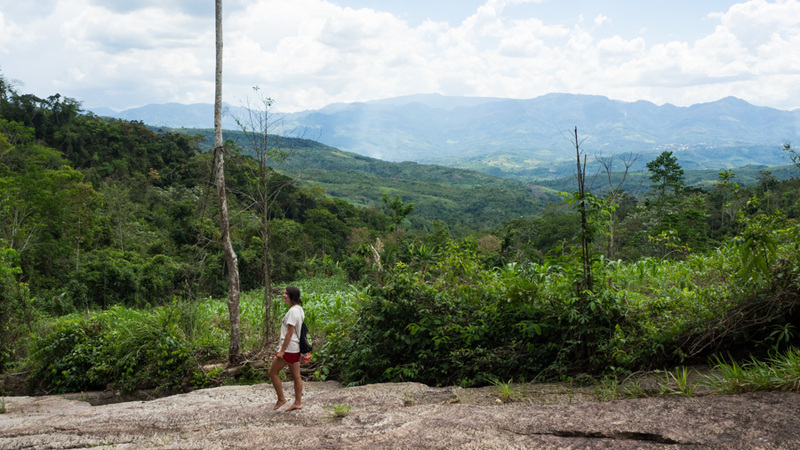 It is an eco-art village surrounded by nature, in proximity to national parks, and protected Amazonian rainforests. 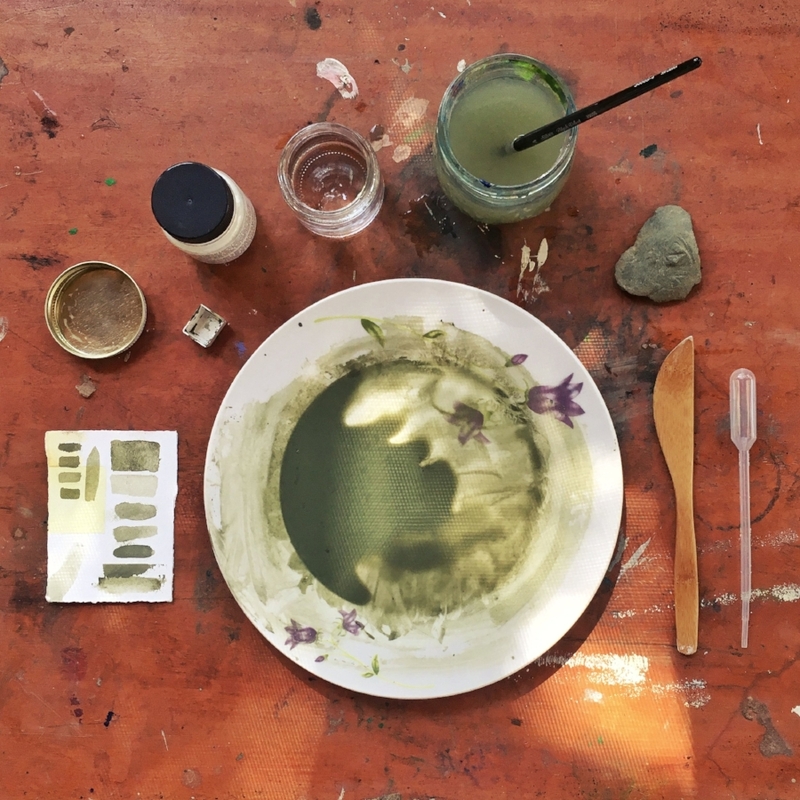 My time was spent making watercolor paints from naturally found pigments and painting with them. I stayed in the little neighborhood of San Roque. It is 30 minutes away by moto-taxi to the nearest city, surrounded by lush jungle foliage and mountains. With my hosts and other resident artists, we explored rivers, waterfalls and paths through the jungle while learning about indegenous cultures and methods. Here people live as one with nature, everyday there is something new to repair and every day you see something you've never seen before. I was amazed at the varied palette of colors I created just from visiting nearby areas. These earth pigments felt so special because I had picked them myself from the ground. Because they are handmade, the inconsistencies buzz in a different way than store bought paints do. To make the paint, first I had to grind the rocks down into a powder. I used a knife or a small saw on the rock until enough pigment came off. Some rocks would fall apart instantly because they were so soft, and others took an hour of labor to get enough powder. Then I crushed those bits in with a little water before adding in gum arabic which is the glue of watercolor paint. 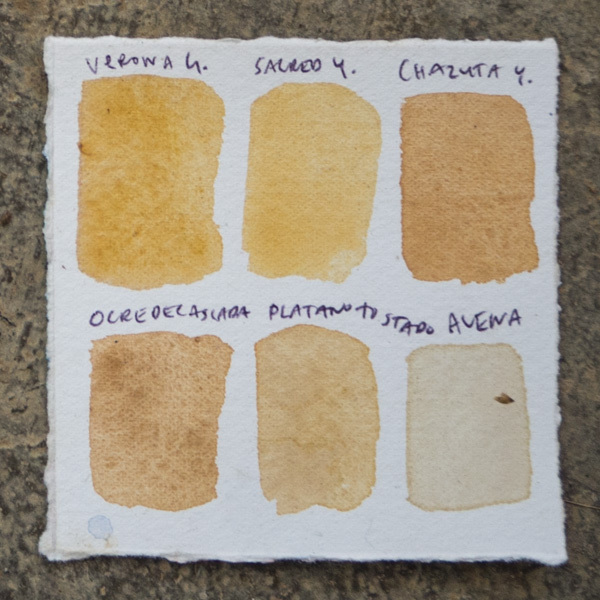 I test the paints quality by making little swatches on paper and let the plate dry in the sun to thicken before scraping the goop into the little square pans for use. This was a pretty laborious process but it made me appreciate store bought paint so much more, realizing how many years of trial and error is imbued in the tubes of paint we have today. These paints were not the easiest to use but I really enjoyed integrating them into my palette. I wrote about my time at the center (read here) but I wanted to share a little bit more about the colors I found and the experiences imbued in the names I gave them. It was pretty hot most days here, and taking a daily dive in the river was necessary to refresh your skin, your mind, your spirit. Along the rivers edge there are rocks everywhere. One of these created a dusty beige. I tested potential paint rocks by rubbing the it in a little water on another rock. If I saw a color I liked, I'd take it home. I probably picked up hundreds of rocks, only taking home my favorite five or ten. On some days here there were flocks of butterflies, creating patterns in their flight paths weaving in and out of each other. So many different animals everywhere!! The name of this color came from a dog that was with us for the first couple weeks. Her name was Arco Iris which means rainbow in spanish. She was sick with tetanus when I arrived, but every day she would lay in the studio, leaving sweat stains wherever she went. Even though she was in so much pain, she would come and lay by your feet or stare at you while I painted. It was a very dusty and mild color just like her fur, and I used all of it up in the paintings I made here. Rest in peace Arco!! Legend states that this waterfall was guarded by a large Huacamaillo bird, also known as a macaw. They have the most intense palette of colors in their feathers, ranging from intense scarlet to turquoise to emerald greens and intense sunny yellows. I don't think there is a paint could be as vivid and complex as this birds plumage. If you can swim against the current of the waterfall you can make it to the water pouring down with great strength. I wondered how much energy is generated by this falling water? I sat underneath and heard the pounding sound of water against my shoulders and my neck. When I couldn't take it any longer, I dove back into the pool to search for yellow rocks littered in the bottom of the water. These were all the rocks I found at this waterfall, the second from the left is the yellow rock I named this one after. We went to visit an organic cacao farm. Here they grow sustainably farmed cacao, medicinal plants and vegetables. The cacao is all ground up by hand and each chocolate is lovingly pressed into a mold and wrapped. The texture of this chocolate vs. factory pressed chocolate reminds me of my handmade paints vs. factory milled ones. We stopped for a moment at a riverbank on our walk there and I found the most intense red little pebble in the water. It was so teeny and extremely hard to grind up. Cacao beans are drying in the sun everywhere. You can smell the intense cacao aroma as these bright red beans ferment in the sun. I named this color after that intense red and that smell. There's a town called Chazuta a couple hours away. They are well known for their artisanal pottery created from the materials around them. Almost every tool they used was something made from natural materials like banana peels and wood chips. 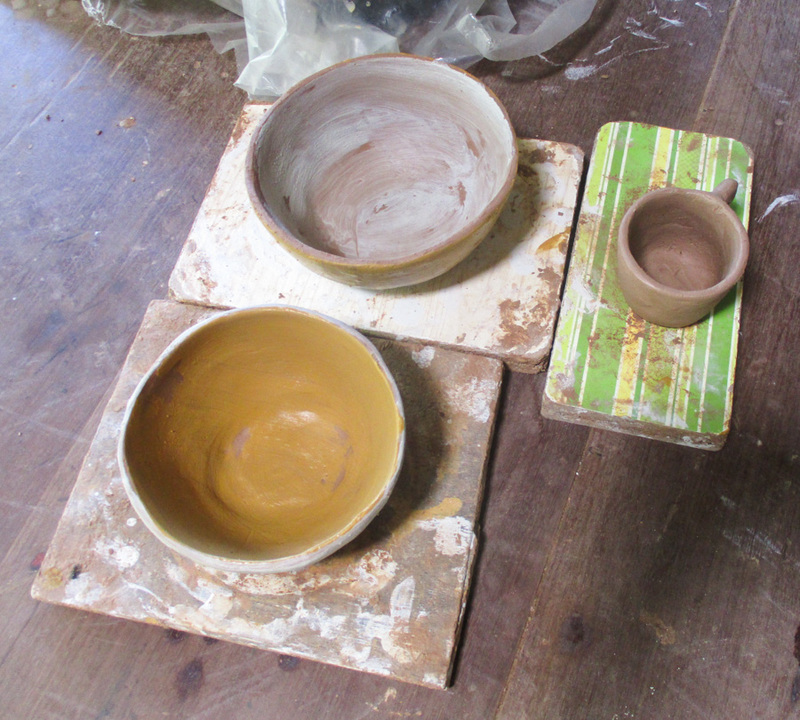 I named this color after the yellow clay they use to color the pottery. After a hike to a nearby conservation area, we arrived at a river flowing with such power and life and so many colorful rocks. I think these were the purest samples I collected during my stay here and the most saturated colors! Some of the paintings I made during this stay. I have prints available of these three paintings here. For me, color is a very emotional and technical medium. Color palettes can translate to chords or flavors, expressing dissonance, harmony or creating balance like adding salt to enhance bitter and sweet things. There's also a certain logic to mixing color, kind of like solving algebra equations to find which colors go where next. I enjoyed navigating a color space that was somewhat undefined because no two rocks are exactly the same as two tubes of paint might be. This process really showed me how paints have personalities beyond it's color and I'm excited to keep exploring natural and man-made ones through my painting.